Ah, the self-driving carno more worries about finding a designated driver or falling asleep at the wheel. Ah, the self-driving car—no more worries about finding a designated driver or falling asleep at the wheel. No tremendous insurance bargains yet, either. 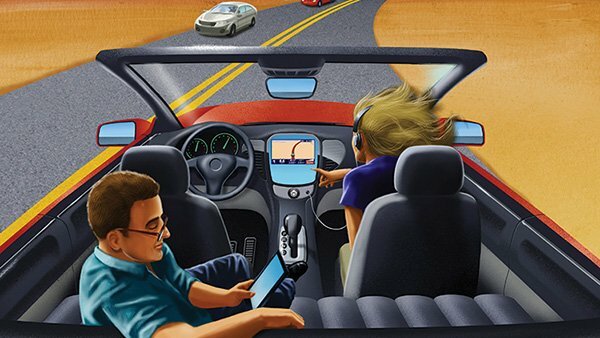 Some self-driving features are already available on some cars, such as collision avoidance, automated parking and traction control, but the day when responsibility for accidents is completely removed from the car’s operator, who still must have hands on the wheel, is quite a way off. A Boston Consulting Group study of consumers gauged their interest in using what they termed autonomous vehicles (AVs). They found that people appear to be far more interested in having an AV than an electric vehicle. Survey respondents said they were willing to pay as much as $5,000 more for a fully self-driving car, although one of the reasons they’re so interested in these vehicles is the potential savings on auto insurance. In fact, saving on their insurance was the top reason cited when people were asked why they’d like to buy a fully autonomous vehicle within the next 10 years. Safety concerns were their second most cited reason. However, according to Loretta Worters, vice president at the Insurance Information Institute, it’s likely to be more than 10 years before insurance costs come down that far. Completely driverless cars may mean a substantial reduction in the number of crashes, but despite that, it’s too soon to tell where auto insurance rates may go. Worters said that it’s going to take time for insurers to observe how various crash avoidance technologies work and to price coverage accordingly. In addition, coverage may include more elements of product liability insurance as accidents become more a function of the quality of a manufacturer’s components. In addition, she said, “many traditional underwriting criteria such as number of accidents, number of miles driven annually, where a car is garaged—those will still apply, but the make, model and style [of the car] will assume greater importance.” In addition, where a car is driven might be important in determining the cost of coverage; if a car is driven chiefly along automated lanes, for instance. Additional, higher-priced features such as “highway autopilot with lane-changing and urban autopilot” will add even more to the price of the car. “We expect that when they are introduced—in roughly 2018 and 2022, respectively—they will be priced from $5,000 to $6,000,” the report said.